.... This is one of the most beautiful beachfront properties in the area. From every room in the condo you see the main swimming pool and ocean just behind it. First time offered for rent since renovation it offers an extra large deck with barbeque, fridge, lots of seating and eating area. Also lots of room inside. Extra large tv offers lots of stations. Casa Del Mar is a top vacation property with restaurant, spa, tennis court, several swimming pools and lots of walking paths. I live in Victoria, BC, Canada and go to Cabo every year for 3 months. I love the condo and keep it up to date.. When I do not use it I offer it for rent and hope my guest love it as much as I do. I consider this the best one bedroom at Casa Del Mar. It looks onto the main pool and ocean. In the evening there is often fireworks that I get a great view of either from my front or back depending on who is doing the fireworks. Also it is top floor. You will see the most beautiful sunsets from every room nd also our oversized large sun deck. Bathrooms have walk in showers. View offers both view of ocean and swimming pool. Well stocked kitchen completely updated. We loved staying at Casa Del Mar! The condo is lovely and so comfortable - it felt like home away from home for sure. Awesome views of the ocean and just steps away from the pool and beach. We’ve had a really great week. Thank you for the great review. We love taking care of the condo and having guest from all over stay there. We will continue to keep it up to standard so people that stay there enjoy it. Fantastic Condo with all the amenities of home! Where to begin? We spent 13 days here from Dec17- Dec 29. The condo is beautiful, spacious, very clean and very comfortable. Great kitchen, very large living area, beautiful bathrooms (2), sizable bedroom with a very comfortable bed, and a FABULOUS balcony! The balcony has lots of seating and a really nice bar-b-cue pit that we used almost every day. The grounds are very well maintained, and make you feel like you are in a tropical world of flowers and palm trees. It is located on "the corridor". We chose not to rent a car, but used the bus to go Cabo, and also to the Selecto and La Comer grocery stores. This location is perfect! The owner was very easy to communicate with. All of my emails were answered in a timely manner, I HIGHLY recommend renting this condo. There is not one negative thing I can say about our stay here. Thank you Gloria for a wonderful place to stay during our time in Cabo. Where to begin... First, you cannot ask for a better owner than Gloria. She worked with us before we rented and checked in on us when Bud became a Cat 3 Hurricane. She spoke with the manager of the resort who kept in contact with us during the last days of our stay which turned it to a tropical storm, thank goodness. Unfortunately, we couldn't use the patio and some parts of the penthouse for a day as they had to bring in the furniture and loose items before the storm hit. In fact, a BRAVO and a sincere heart-felt thanks to ALL the workers there. They took care of my wife's accessibility needs during the storm, Angels, all of them, and we made it safely to the airport even with no wipers on the car. We were one of only four flights that left Cabo that day and we were the last ones two and half hours after our original take off time. WHEW!! This penthouse is amazing! All the comforts, the views, the pool, and beach take your breath away. Can't swim in the ocean because of a vicious rip current and undertow, but those waves sooth by sight and sound especially at night. There are beaches nearby though and can even snorkel there. The facilities are well stocked. I actually left a gift of Worcestershire Sauce for steaks as their grill outside made for great dinners. There's also a great fresh fish market in San Jose del Cabo as well. After a long day or night of fun and frivolity, it certainly was nice to get back to peace n quiet listening only to the waves crashing. They had an event of fireworks and a party for guest at the main resort, too. I found out they have more activities like pot lucks and parties at the pool from Nov - Mar. We rented a car and I highly recommend it. You will save in Taxi fares. You will have to get used to the Mad Max Hwy though...just stay to the right if you go slower than traffic. Also, I highly recommend "Monkey Business", a bar with the best Margaritas you've ever had in Cabo. In addition, swimming with Dolphins checked off a bucket list item for us. The food is glorious. There's a Walmart and Costco where the exchange rate is better than other stores. Again, I highly recommend this property as Gloria, the resort staff, and this place make your stay memorable. People, it is always about good people. And yes, yes they are. Thank you, Gloria, for everything! 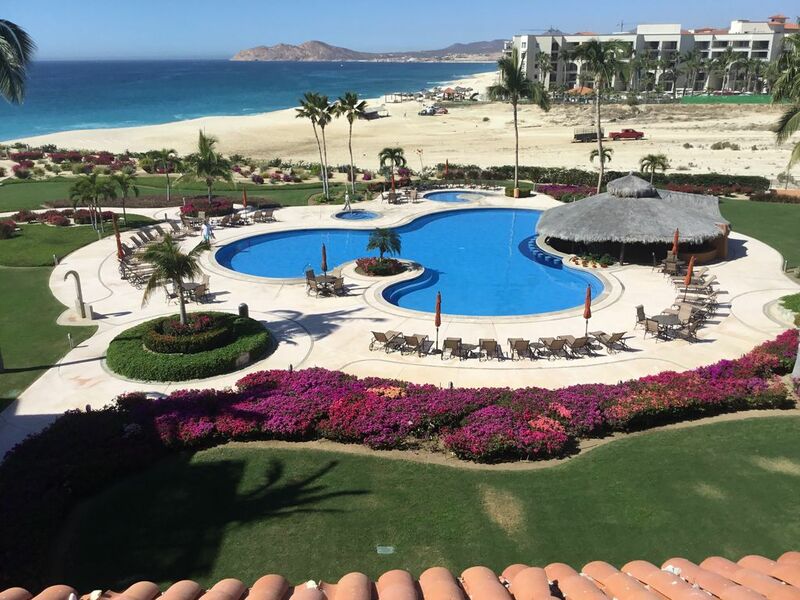 We had such a great time in Cabo and this condo was perfect! It is very clean and well stocked. Most of our time was spent outside on the amazing deck, from morning coffee to evening cocktails. We loved it! The view was amazing, and it was fun to watch the whales in the distance. The location was also perfect for us; right between the two cities in a quiet location. It's an easy drive to either city. The staff was also very kind. We cannot wait to return! Thanks to Gloria! Wow, what a great review. I will continue to keep the condo up so as not to disappoint anyone. Everything was above expectations. Great location over looking the pool and ocean, well équipes and very comfortable. Perfect property for a relaxing holiday. The condo was everything we were looking for to relax and enjoy a beach holiday. We both started and ended our day on the patio; perfect area for preparing meals and dining while watching the ocean. The view was spectacular with no buildings or foliage blocking the stunning view. The 70" television was amazing for watching baseball and the hockey playoffs. Kitchen was well stocked and so was the patio; it was like having two dining areas. We overlooked the pool and met so many nice people enjoying that area. Played some tennis and also enjoyed nachos at the hotel restaurant. We started each day with a walk on the beach and saw whales from the shore. There was also a well marked sea turtle nest just up the beach. Five plus stars for this condo and we can't wait to come back! This is my first guest and my first review. I can not be more greatful to my renters for this review. I will try very hard to keep this condo at this level.